The Chorale recently embarked upon another exciting trip abroad, this time visiting Glen Ellyn's Sister City of Le Bouscat, France. The Sister City partnership was formed in April 2014 in order to foster mutual opportunities for cultural, educational, and economic exchanges that highlight the diversity and rich culture between the two international partners. Le Bouscat is located in the Bordeaux region of France and shares many similarities with Glen Ellyn, such as population size, a strong local economy, and a vibrant and engaged citizenry. 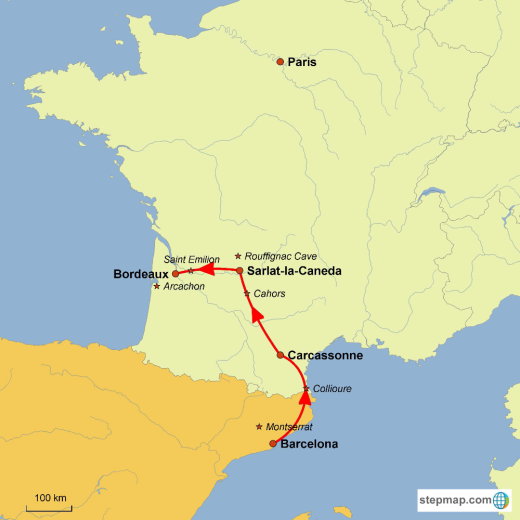 The Chorale's 10-day tour began in Barcelona, Spain, continuing on to Carcassonne, Sarlat-la-Canéda, and Bordeaux in France. Throughout the tour we enjoyed singing informally and formally at various venues such as Sagrada Familia in Barcelona, Basilica of St. Nazaire in Carcassonne, Sarlat Cathedral in Sarlat, and a monolithic church in Bordeaux. We also provided a special performance during the Fête de la Musique in Limoux. We were excited to include joint concerts en route with the Chorale Populaire de Limoux, the Ensemble Chorale de Sarlat, and the Chorale Pizzicati in Le Bouscat. See our photo albums related to this 2016 Spain & France GEWC Tour!